As we get ready for the continuation of the Star Wars saga with this December’s Star Wars: The Force Awakens, let’s look back at the previous six films of this iconic film series. Putting opinions aside, the first six Star Wars films will now forever be known as the ones that Star Wars creator George Lucas directly worked on. They bear the mark of what he intended for the overall story and for better or worse reflect his vision for the Star Wars saga. For the first retrospective of the entire star spanning saga, we begin not with the very first Star Wars film made but with the first chronological film in the saga: Star Wars Episode I: The Phantom Menace. The setting for Episode I as are the rest of the films is long ago in a distant galaxy. Large parts of it are ruled by the Galactic Republic. Consisting of thousands of worlds, the Republic’s relative peace for generations is at risk because of one of its members: the Trade Federation. In the film’s opening crawl, the Trade Federation is up in arms with the Republic over taxes on trade routes of the outer worlds. Their idea to resolve this issue is to place a blockade on the planet Naboo. The Republic’s ruling chancellor dispatches two Jedi Knights, Qui-Gon Jinn (Liam Neeson) and Obi-Wan Kenobi (Ewan MaGregor), to negotiate with Nute Gunray (Silas Carson), the Viceroy of the Federation. at his flagship orbiting Naboo. Not long after they arrive , the mystical warriors are attacked by the Federation’s droid soldiers who have orders to kill the Jedi. The relative ease to which the Jedi take out the mechanical troops is our first taste as to the true height of the Jedi’s powers. During the battle, the Jedi learn that the Federation are about to land troops on Naboo, so they hitch a ride on one of the invading ships and arrive on the planet to warn the inhabitants. Along the way, Qui-Gon saves a strange and goofy alien native, an amphibious Gungan called Jar Jar Binks (Ahmed Best). The floppy eared alien decides to tag along with the Jedi because of a life debt owed to them as they make their way to the Naboo capital. Once the trio reach the capital, the Jedi manage to rescue the planet’s ruling queen, Padme Amdilla (Natalie Portman), and her royal entourage, who were being held hostage by the Trade Federation’s droid army. 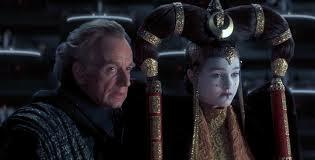 They were captured by Gunray because he wanted to force the queen to sign a treaty legalizing the occupation of Naboo. After easily dispatching the cannon-fodder droid army in the city, the Jedi and the others board a spaceship and break the orbital blockade. 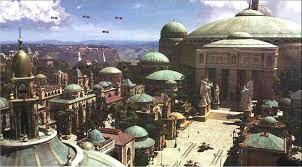 The queen wants to go to Coruscant, the capital world of the Republic, to plea for intervention. But although the ship is able to jump into hyperspace during the escape it was damaged. This forces them to set down for repairs in a nearby world: Tatooine, a desert planet that is outside the Republic’s domain. On the backwater world, Qui-Gon, Obi-Wan, and Jar Jar leave for one of Tatooine’s towns Mos Espa to get spare parts for their ship. Joining them at the behest of the queen is one of her handmaidens, who is actually Padme herself pretending to be a commoner. They meet a coarse junk dealer called Watoo (voiced by Andy Secombe) who has the engine parts they need, but they’re unable to pay for them. 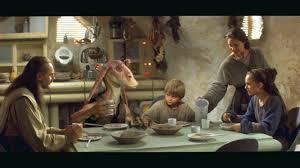 During the visit to Watoo’s business, they meet his young human slave, Anakin Skywalker (Jake Lloyd), who befriends them and offers shelter in his mother’s home from a coming sandstorm. 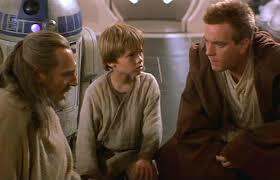 Qui-Gon immediately senses that the Force is strong in Anakin and takes a fast interest in the boy. For those who have been living under a rock since 1977 the Force is a metaphysical power in the Star Wars universe that is wielded by the Jedi and their opponents the Sith. According to Star Wars lore it’s a form of energy that flows through all life forms and those who are adept at using it can perform superhuman acts like telekinesis, controlling weak minds and so on. 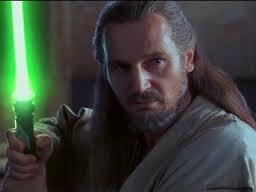 Qui-Gon wants to recruit the young slave and train him as a Jedi, but first he has to win the boy’s freedom. To accomplish this, he convinces Watoo to enter Anakin in a dangerous pod race where racers speed through the desert climes of Tatooine in cobbled together engine parts and makeshift carriages. 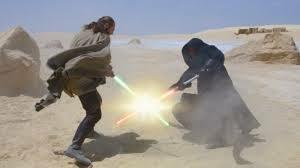 If Anakin wins he’s to be freed as part of the conditions of a bet the Qui-Gon and Watoo placed with each other. Additionally, if Anakin wins, Qui-Gon will be able to get the parts needed for the queen’s ship so they can leave for Coruscant. Unbeknownst to the group is that the Jedi are being tracked by Darth Maul (Ray Park) a devilish Sith apprentice and his superior Darth Sidious (Ian McDiarmid). Throughout the film, Sidious has been manipulating and controlling the Trade Federation for his own mysterious reasons and is the mastermind behind the Naboo invasion. More importantly, Sidious wants to renew the ancient feud his order has against the Jedi. While the heroes busy themselves with leaving Tatooine, reaching Coruscant and finding a way to end the Federation occupation, sinister forces are aligning against the Jedi and the Republic. Soon, Qui-Gon and Obi-Wan will confront the deadly Sith as they attempt to free Naboo, and it’s an encounter which will have lasting ramifications throughout the galaxy. 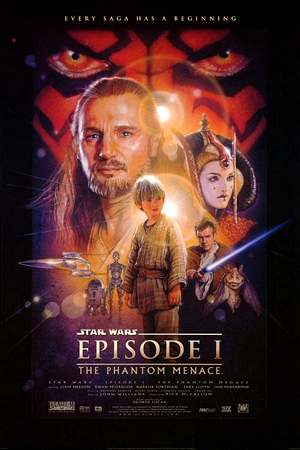 Star Wars Episode I: The Phantom Menace was probably the most eagerly awaited film in history. For sixteen years, fans had to endure a drought of Star Wars films after Return of the Jedi (ROTJ) came out in 1983 and there was doubt if there would ever be another Star Wars film. After ROTJ, George Lucas was burned out, plus the limitations of effects technology hampered his ability to bring forth his visions in additional films. However, Lucas changed his mind after some time. He saw in the early ’90s that Star Wars was still popular thanks to the success of spinoff books and comic books. More importantly, he was impressed with the effects technology, specifically the emerging CG effect featured in films like Terminator 2: Judgment Day and Jurassic Park. At last, he felt that he could bring his true unhindered vision to film thanks to the new CG technology. Lucas had been fascinated with the backstory to the Star Wars saga and Darth Vader’s origin, which he wrote as a fifteen-page outline back when he was developing the very first film in the ’70s. Hence, the reason why his followup to the original trilogy would be prequels. He began writing the film in November 1994 and photography started in 1997 after Lucas assembled a production team that included Rick McCallum as the producer, designer Doug Chiang and veterans like John Williams for the score and Ben Burtt for the distinctive sounds of Star Wars. One thing that is noticeable between this film and the first three had to be the richness of the production design. That included elaborate costumes, well-conceived animals and overly detailed sets. Of course, the drawback was that many of these sets were full CG renderings and were fairly obvious. Add some bizarre characters and creatures that can’t possibly exist and viewers are given the impression of watching an animated film. That wouldn’t be so detrimental if Star Wars Episode I: The Phantom Menace was a better entry. This isn’t to say that the film is horrible, it does have its merits. 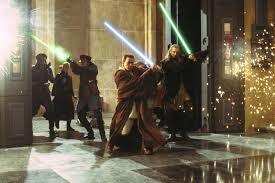 There were many exciting moments particularly with the big battles and the epic Jedi/Sith lightsaber duel in the end. 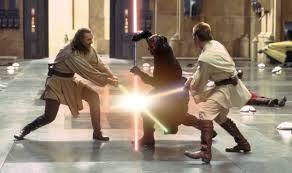 The fight between Qui-Gon, Obi-Wan and Darth Maul was very kinetic and rousing thanks to John Williams stirring score (the bombastic operatic theme “Duel of the Fates”) and the stunt work by stunt coordinator Nick Gillard. For the scenes he adopted new fighting styles for the actors based on the kendo and kenjutsu swordfighting styles and compared them to a physical chess match. The special effects were quite excellent even if they weren’t groundbreaking. A drawback to the overuse of CG in the film is that it lacks the immersive illusion that worked in the earlier films. But that is a byproduct of the intentional look of the film. George Lucas wanted the prequel films to look very lavish and pristine, which was reflected in the opulent look of Naboo and the busy feel of Coruscant. In this time period, the galaxy wasn’t run down and dirty like in the original films. Lucas should be credited for going for a different look but fans clearly preferred the less artificial nature of the earlier films. He should also be commended for trying to expand the Star Wars universe and make it more complex by giving us a look at the politics of that universe. It was a slightly evocative of Dune and the recent Star Trek TV shows. Unfortunately, it’s not very well thought out and not explained sufficiently. At times, the political scenes are just plain dull to watch as Padme endures political haggling with bureaucrats in Coruscant. But keep an eye out for some E.T.s that make a cameo, a tribute to Lucas’ friend, fellow filmmaker Steven Spielberg. Adding to the sometimes lackluster pace are the wooden performances from many actors. The only standouts were Liam Neeson, Ewan McGregor, who emoted the late Alec Guinness thanks to studying the elder actor’s works. Some notable actors have throw away appearances like Terrance Stamp as Chancellor Valorum (who is partly inspired by Bill Clinton – a good, but beleaguered politician), and Keira Knightly as Sabé a handmaiden and decoy of queen. Other performances from the likes of Portman, and Pernilla August (as Anakin’s mother Shmi) are unbelievably wooden and belie Lucas’ rusty directing skills. It would have been best if George Lucas had directed other films in between this and the very first Star Wars films because it would have kept up his directing chops. The argument for this is with his last directorial effort Star Wars Episode III: Revenge of the Sith, which was a vast improvement over this one and the second prequel film. Another thing that would’ve helped the first prequel was if Lucas had some help writing the script. So much of the dialogue is monotonous and the flat deliveries from the actors don’t help. Therein lies the core problem with this film. In addition to the listless dialogue and uneven pacing, what plagues it are the story and characters, which needed another pass in the editing process. Let’s start with the invasion of Naboo. Supposedly the Trade Federation is up in arms over high taxes so their solution is to invade another planet. What would that accomplish? Why is Naboo so important? Why are only two Jedi sent to negotiate, shouldn’t that be left to diplomats? Why is it that the Republic doesn’t seem to have a standing army (a point somewhat explored in the next film) and solely rely on the Jedi? Then there is the obtuseness of the Jedi themselves. Why are they unwilling to have Anakin trained as a Jedi? This boy has an undeniable adeptness with the Force, why not take advantage of that? In the previous films, the Jedi were hinted at as a revered, mystical order, yet here in their glory they come off as a bunch of sticks in the mud, with Qui-Gon being the only one to show any bravado and wisdom. It’s a shame he isn’t more explored. The same goes for Obi-Wan and Padme. Instead, the person Lucas chose to focus on was Anakin Skywalker. When first writing the script, George Lucas had Anakin as a twelve year old but made him younger because he wanted his separation from his mother to be more traumatic. That was a mistake because it made the age differences between him and his future love interest more jarring and it made him too likeable. Also, the revelation that he was a product of a virgin birth is too on the nose with the film’s biblical influences and never examined adequately. Remember, this child will grow up to be Darth Vader, he should’ve exhibited more of a dark side. Instead, he runs around happily yelling “Yippee!” and Lloyd’s inexperience as an actor didn’t help matters. A cynic could argue that Anakin was made younger solely to appeal to younger audiences and increase merchandising sales. That charge could also be applied to other characters especially Jar Jar Binks, the biggest misfire of the film. As a supposed comedy relief, Jar Jar is painfully unfunny and comes off as an annoying and clumsy hindrance. And the way he speaks with his bastardization of English…dear God that was painful to listen to. His only amusing scenes come near the end when he takes part in the Gungans’ battle with the Trade Federation. Angry fans who were anticipating the next Citizen Kane were bitterly disappointed and they would never again look at Star Wars in the same reverential manner. Part of the reason for the hate had to do with the unrealistic expectations showered upon the film and the relentless, over-the-top marketing. The result was that it would’ve disappointed many and so it did. If it was better made then that wouldn’t be the case. Sadly, the film tainted the outlook for the next two films in the prequel trilogy, which was a shame because they were better entries. No argument here, this is the weakest Star Wars film to date, but despite its faults, Star Wars Episode I: The Phantom Menace does have its moments and has had a profound influence on Star Wars.